For some, Valentine’s Day is about giving out candy grams in class, or handing a rose to a crush, but for René Jameson it is about sending love to the elderly folks in her community who may have not gotten a valentine in years. 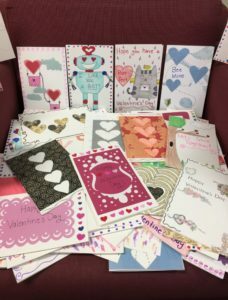 Each year, in her hometown of Greenwich, Connecticut, she makes over 200 handmade cards and personally delivers them to the senior community. 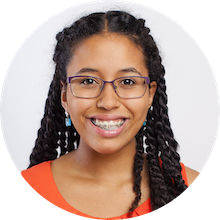 This is just one of the many impactful projects she spearheads every year, as she takes her seat on the Roots & Shoots U.S. National Youth Leadership Council (NYLC) for the third year in a row. With support from the Jane Goodall Institute, members of the NYLC receive leadership training and guidance from Roots & Shoots staff which they then share with hundreds of thousands of Roots & Shoots members around the world as the youth representatives of the Jane Goodall Institute. We caught up with René to get to know the thoughts, quirks and inspiration behind this humanitarian teen. Q: What is your favorite “lazy day” activity? René: I love to read and relax with my cat. The Secret Life of Bees and Americanah are probably my two favorite books. You can also find me knitting. This is going to sound so nerdy, but I knit scarves. I am hoping that I will soon be skilled enough to knit hats for premature babies at the hospital. To test the size of the hats I’ve been trying them out my cats. Q: What is your favorite Roots & Shoots project that you’ve done and why? René: Well right now I have a project in works that I began last summer to build a community garden at my school, Greenwich High School. Last summer I was accepted into a program called ANNPower Vital Voices to be one of 50 fellows out of 4500 applicants. The program supports young women who want to change the world and provides them with the resources to impart global change. I went to a program in New York for a few days with all of the other inspiring women to meet with mentors to advise us on how to make our ideas into projects. My mentor, Kah Walla, is just incredible. Originally from Cameroon, she was kidnapped by her government for being an activist against political corruption, but managed to escape. When mentoring me, she stressed that when we are pursuing projects, we should make sure we have some personal connection to the issue. You want to improve the world for yourself too, not in a selfish way, but you want to grow through the project. So in order to address issues that are close to myself and kids my own age, I decided to create a community garden. From the program I applied for a grant and received $2,500 to create the garden. The purpose of the garden is to increase access to nutritious and sustainable foods for the Greenwich community. Even though Greenwich is stereotyped to be very affluent, there are many problems with food insecurity, and I want to make sure that people are aware of this issue. I think that access to healthy food should just be a given for all people, especially children. All produce grown in the garden will be donated to my local food bank to make sure there is balance in the distributed foods. The most important word in Community Garden is the “community” aspect; although I am facilitating it, I am not doing it alone. I didn’t have the slightest idea how to garden when I started this but I have learned so much about diversity. Even on a scientific level, diversity is proven to be beneficial. All the same types of vegetables planted near one another would deprive the same nutrients from the soil. That is just such a prime example of the intersection of plants, animals and the environment that Jane talks about and how humans can learn from those other fields. Q: What has been one of your failures that has taught you something valuable? René: At the beginning of my Freshman year, I ran in student government to be Class President, and I had so many good ideas for creating positive change at my school. It was announced over the loud speaker who was President and it wasn’t me, and I felt so embarrassed. Not long after that, I was accepted onto the NYLC, which ended up becoming an organization that has changed my life. I don’t regret running at all; it improved my public speaking, and it was a great opportunity to meet new people. I personally believe that everything happens for a reason, and my life changed in a way I didn’t expect. Q: What inspires you to be an activist? How did you get started in this work? René: Other activists. Other people have worked so hard to starts projects, and to pave the way for change. If it wasn’t for the previous fights of other activists, particularly African American women, I wouldn’t be able to do the work that I do today. It has inspired me to not only continue their activism, but to accomplish more. I find it hard to talk about particular women that inspire me since there are so many in the past who have accomplished many things that aren’t being recognized in the present. We don’t know their names, and those are the women who I am thankful for. But if I had to choose a woman in particular that I adore, I would say Rosa Parks. She was so done with what everyone wanted her to do and that one action of her refusing to move started an entire movement of the bus boycott. I think this really connects to Dr. Jane’s concept that small actions add up to make a huge difference. Dr. Jane has been a huge role model of mine. I love that she’s a woman who redefined man. I firmly respect her idea that just because there may be a problem that doesn’t affect you directly doesn’t mean that it isn’t your problem. I actually started doing service work at the age of 5, volunteering at the local library. I would help the elderly operate computers, which I know is hard to believe at that age, but I just loved being in that environment. Q: What advice do you have for other young people who want to get involved in their communities or make a difference for the world? René: Never underestimate your ability to make a difference. At times we can feel hopeless when we look at what is going on in the world. But there is so much beauty in the world and this is essential to recognize in order to accomplish something. Even though we may be young, we are strong capable human beings. Put yourself out there and collaborate with other people to make the world a better place. We shouldn’t be secure in what we already have, because that doesn’t make for positive change. Q: Today is Valentine’s Day, can you tell us a bit more about your Valentine’s Day project? René: Every year I hand make around 200-250 Valentine’s Day care cards. I partner with a local non-profit, called At Home in Greenwich, that cares for the elderly and makes sure they are being taken care of, are comfortable in their homes, and have access to healthcare, etc. A lot of them are often isolated in their homes. That’s why I handmade the cards, because it feels very personal, I feel a connection every time I make one. Once they are delivered, I hear so much news about them; one woman told me she hadn’t received a card in years, and that was so touching. It is a big task and it takes days, but it is a nice break for me from school work. All the cards are eco-friendly because all the paper is recycled, and I try to use the least amount of materials possible. 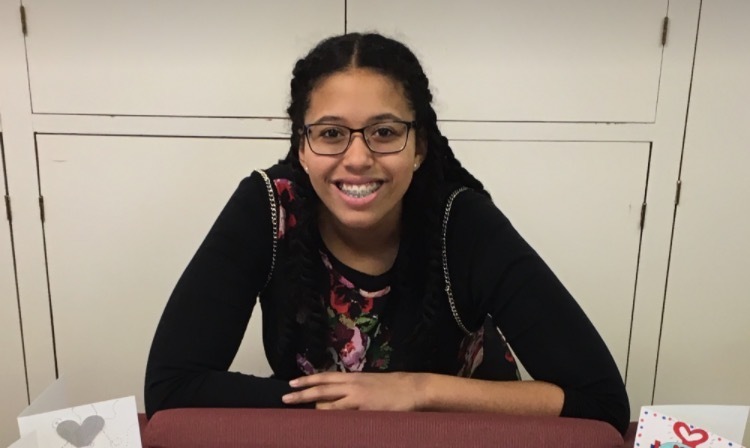 To learn more about influential young leaders like René, check out the Roots & Shoots U.S. National Youth Leadership Council (NYLC). Educators and Roots & Shoots groups, you can invite René or another member of the NYLC to visit or Skype with your classroom/group to talk about their Roots & Shoots work and share tips for your next service campaign! Click here to learn more. René inspires her peers, is empathetic, and is a team player. In fact, she possess all of the skills and traits of a compassionate leader. 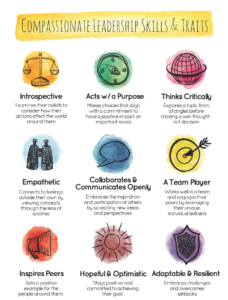 Fostering these traits in young people is our way of working toward a better future — one where leaders from the playground to the boardroom make decisions that are good for people, other animals, and the environment. Read more about compassionate leadership skills and traits here. 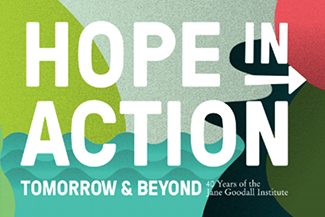 Educators, we’ve designed a free, online course to support you as you grow compassionate leaders through service learning. Join the course. Previous ArticleAren’t We All #MoreThanWhatYouSee? Next Article A Lucky Day: World Pangolin Day!